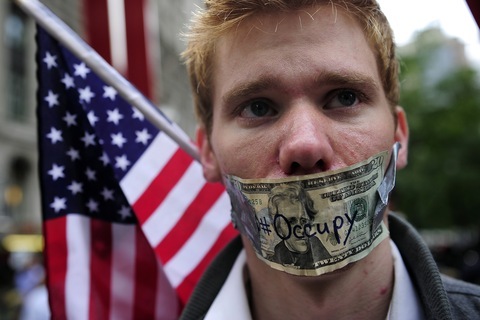 Are Occupy Wall Street, Tea Party Signs of Building Populist Movements? What began in Manhattan more than three weeks ago with the rallying cry to “occupy Wall Street” has grown to become something more. The loosely organized liberal protest group has used social media to spread to scores of others cities — from Washington to San Diego to Missoula, Mont. Many of the protests are shorter affairs — an afternoon of marching — and not the long-term “occupation” in New York’s Zuccotti Park. But the size and spread of the protests have caught the attention of media from across the spectrum – from The New York Times opinion pages to Forbes.com. Meanwhile, voices in the conservative Tea Party movement have offered their critiques. But as many have noted already, however, when you look closely at the “Occupy Together” and Tea Party movements there are more than a few similarities. Both are loosely organized, both express anger toward groups in power and both are calling from complicated sets of big changes to help a country they feel is off track. Both groups, in short, bare the hallmarks of populist movements – or at least the beginnings of populist movements. The movements do not come as a big surprise to Patchwork Nation. We have argued for some time that the United States is ripe for some kind of populist uprising in the next decade, due to ongoing economic and cultural shifts. And they may be just the beginning. Much has been made of the recession and its affect on long-term unemployment, but as Patchwork Nation has noted, the recession has just exacerbated longer-term rises in economic inequality. Since 1980, seven of the 12 county types in Patchwork Nation have seen their median family incomes fall in inflation-adjusted dollars. The map below shows the changes by county. As credit has dried up in the recession and unemployment and foreclosures have risen, those lower incomes have become more obvious. And as Congress debates whether to raise taxes on the wealthy — either households making more than $250,000 or $1 million a year – it’s helpful to keep in mind just how few people fall into either of those categories. Nationally, only 4 percent of households earn more than $200,000 annually. In many of our 12 county types, far fewer make that kind of money. Even in a very wealthy county like New York, N.Y., only 16 percent of households are in that group. And new Census data show that U.S. incomes have been falling even after the recession. Those facts will resonate as Washington debates how much to tax the wealthy. Add it all together and you have a recipe for populist movements. past analyses, we have noted the strong pull of the Tea Party in especially in formerly growing Boom Town counties, the socially conservative Evangelical Epicenters, heavily Latino Immigration Nation and the Military Bastions. The Occupy Together groups are even harder to measure. They are currently an amorphous collection of protesters marching and camping out in different cities. But the places where the group has made the most noise so far has been the big city Industrial Metropolis counties. Al Jazeera has posted a map of places where Occupy Together has been active. But when you look at Patchwork Nation’s 12 county types, there are some notable omissions from those lists. The small-town Service Worker Centers and heavily African-American Minority Central counties for instance have not been big players with either group. Or at least, not yet. Those counties have few $200,000-plus earners and have seen their median family incomes fall in the past 30 years. They generally lack the population density to create sudden grassroots movements, but they have ample reasons to be unhappy with their lot as well. In other words, as the Tea Party prepares to make its influence felt in 2012 and the Occupy Together groups gather strength, there is no reason to believe they will be alone. Economic uncertainty and cultural shifts create hard feelings and frustration. There may be many more twists and turns — and more movements — to come on America’s current populist path. For more NewsHour coverage of the Occupy Wall Street, check out Paul Solman’s report and Judy Woodruff’s discussion. Also, check out Paul Solman’s series on economic inequality.